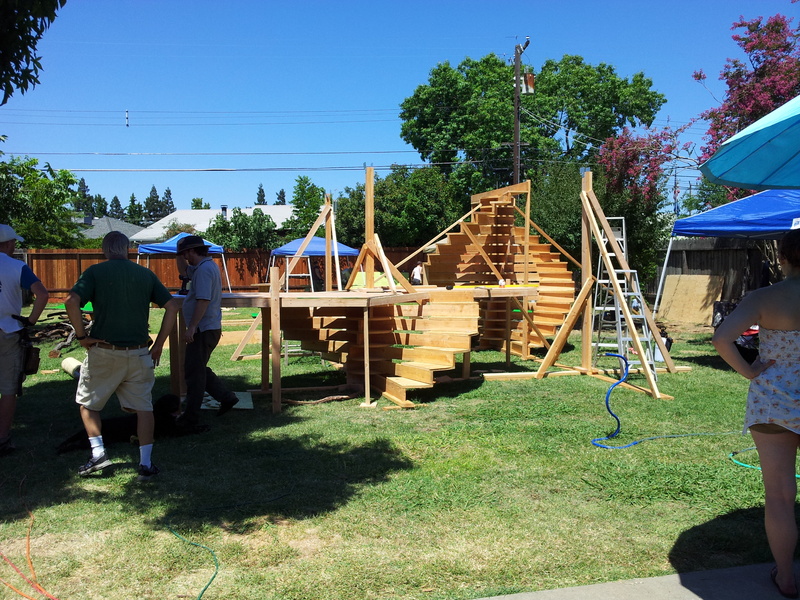 I’d never worked on an art project for Burning Man until this past weekend when Judie and I helped in the construction of the Sacramento core project. The 35 selected core projects will go around the man this year and were chosen from among a multitude of regional proposals from all over the world. Our project — called “Aboria” — is a wooden “tree house” that sits under a canopy of leaves. It’s a remarkable bit of engineering by some truly talented volunteers. We were mere “grunt” workers, mainly painting and drilling. But Judie and I got to try our hands at creating cut-outs of designs on wooden boards with a jigsaw. It was my first time with a jigsaw, so that was a new adventure for me. The best part of the day was simply knowing that we’d had a hand in the construction of this amazing project, which will be seen by thousands of people this year on the playa (and burned on Thursday night along with the other regional projects). But it also reminded me of how integral to Burning Man’s success is the concept of contributing to the community. Being even a minor part of the Sacramento core project has made me feel more involved in the burn. I’m now more excited than ever about getting back to the playa this year so I can see our finished project in all its glory. There are myriad opportunities to make contributions to Black Rock City and the Burning Man community. Every theme camp adds to the mix, so whatever work you do for your theme camp is contributing to the city. Many of us bring gifts that we like to share with others on the playa. Every attendee adds to the richness and diversity of the Burning Man population by their presence. You don’t have to take on immense responsibilities to contribute – just help out a little here or there. Volunteer at one of the many places needing help such as our own Lamplighters group. It takes volunteers to light the city every night and it’s easy to participate. Just show up at 5 p.m. at the Lamplighters cathedral near Center Camp to take on one of the jobs. Volunteering for Lamplighters is an unforgettable experience, and you’ll be rewarded with a charm especially made for this year’s burn. And Lamplighters is just one opportunity to contribute to the wonder of Burning Man. Look around and you’ll find plenty of ways to get involved. Take a shift at the café, see if help is needed in the medical tents, volunteer as a greeter or a Temple Guardian; or just lend a hand when you see someone struggling to get a project off the ground. What I learned this past weekend in Sacramento is that you’re never too old to help. In fact, it makes you feel young to pitch in.